Well the luck had to run out sometime, and this was it. First painting in “The List” which I felt was unsuitable for exhibition since painting number 5 and so I will list it as not for sale – not frame it and generally put it on the naughty step. When I say “luck” I refer to my expectation of creating a masterpiece under the following restrictive conditions. Paint from hotel room with no prior knowledge of view. Bring along a canvas of proportions that may or may not suit said view. Limited time to prep – ie quick pencil sketch to work out view I want to capture. Don’t use your 4 days there to do several sketches to see what works and leave it all to the final evening. Select a canvas based on portability and that I had a pre-made frame for it so could enter the piece in the next Eagle Gallery exhibition. The view is from a Campanile hotel room. We stayed there while my wife attended a conference in Glasgow. Thankfully my walks around the town centre in my time there generated some useful photographic reference material that I’m sure will contribute to future works. So this view is the night-time view of the pedestrian footbridge linking a multi-storey car park and the SSE Hydro event space. In the distance on the hill is the Kelvingrove museum and art gallery, hence the title “Towards Kelvingrove”. I took various photos during the evening so that I had good reference material to complete the image back in the studio. Initially the work was done as an observational piece, capturing life as it unfolded in front of me. Any meaning and actual point could be thought about later perhaps. 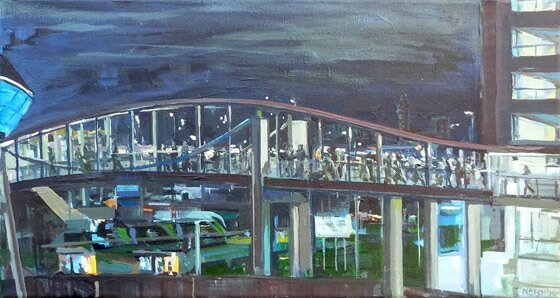 Having said that, the “Towards Kelvingrove” aspect of the piece was bubbling away during the live sitting. I quite liked the idea that as culture evolves; the new buildings cover up the old perhaps. As a night view this idea becomes overly subtle. I think the composition was perhaps a mistake – wanting to include too much. The side on view also meant I was forever searching for a centre of interest. If I was to continue to flog this particular dead horse, I think my next attempt at making sense of it would be to have someone with a balloon or several balloons crossing the bridge, thereby leading the eye in. The main dangers in tightening and neatening a ‘live’ scene like this after the event are as follows:- The immediacy goes, and that when certain bits of the image become more accurate other bits stand out as less correct. In this instance the curve of the bridge is too exaggerated (didn’t dawn on me on the day) which as part of a flowing image is less of a problem. So I gave up! – I took an old painting down to the “Eagle” for that month’s exhibition and consigned this piece to the loft.